With around 700 participants from over 60 countries, the fifth biennial incarnation of the International One Health Congress opened in Saskatoon on Friday 22 June. As befits this growing and leading gathering of One Health researchers,policymakers, commercial partners and postgrads, the Congress kicked off even before it formally started, with a couple of ‘special sessions’ on prion diseases and antimicrobial resistance, underlining the close interaction of animal, environmental and human health impacting on these two major topics of concern. Following an opening ceremony on the Friday evening, fittingly focussing on the proud inclusivity of Saskatchewan for all its inhabitants, the meeting was formally blessed in Cree by an elder member of the Métis Nation, from the first nations of the territory that now forms the city of Saskatoon. There followed three days of packed programme, starting unfashionably early each day and including four parallel tracks, two on ‘One Health science’ and one each on ‘Antimicrobial agents and resistance’ and ‘Science policy interface’. Stefano Catalano presented his work on an emerging trematode, Plagiorchis, identified in small mammals (mice and voles) in Senegal, where it has an unusual presentation as a liver infection and a potential as a zoonoses. Stefano also presented work on the importance of rodents on schistosomiasis in West Africa, confirming their role as a definitive host alongside the human population. Mahbubur Rahman described the aerosolisation of influenza virus from markets selling poultry in Bangladesh, demonstrating evidence of contamination of market personnel with influenza A virus from the birds, in particular associated with the presence of ducks in the market. Laura Craighead spoke on brucellosis in West Africa and evaluated factors that will determine scenarios for control, highlighting the heterogeneity of periurban dairy production systems between countries which will impact on chosen control programmes. Will de Glanville (below right) presented research from Tanzania that helps explain variation in infection risk in both humans and animals for a selection of zoonotic and livestock diseases, including brucellosis, Q-fever and rift valley fever, demonstrating that the highest burden from these and a number of other diseases falls on livestock in pastoralist management systems (for which Will also defined a robust method of classification). Violet Barasa (below left) described work on the drivers of infectious in northern Tanzania, taking a mixed-methods approach to animal-human interaction, and demonstrating that particular sections of the community, young boys and adult women, were perhaps more likely to be exposed to zoonoses than other family members. Jennika Virhia presented her work on health-seeking behaviour in agro-pastoralists in Tanzania, demonstrating the complex process which many rural populations need to negotiate to obtain effective health support. Through the miracle of tablet technology, Paul Johnson created a dynamic poster demonstrating inter-market livestock movements in Tanzania over time, which attracted a lot of attention (it didn’t take long for his neighbouring posters to adopt similar computer technology to demonstrate their modelling approaches). Although unable to attend in person, Gemma Chaters’ work on modelling livestock movements and potential impact on disease spread was also presented. Similarly, Jo Halliday’s work on Brucellosis in Tanzania was presented in her absence by a number of colleagues – this work demonstrated the power of modelling to determine the importance of Brucella melitensis and small ruminants as a source of brucellosis in humans. 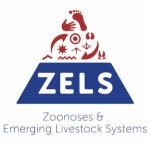 In addition, and emphasising the collaborative nature of One Health research, a number of partners from the ZELS programme presented related research supported by other funders. This included Felix Lankester and Thumbi Mwangi from Washington State University presenting work on a variety of aspects of rabies control in Africa. Gabriel Shirima from the Nelson Mandela African Institution of Science and Technology in Arusha, presented the One Health policy being actively implemented in Tanzania. Rhoda Aminu from the University of Glasgow described work on anthrax in impoverished communities in Tanzania, underlining the substantial losses and impact of the disease on local communities. The Congress was well planned, and comprehensively filled the time attributed to it. The organising committee from the One Health Platform, in particular Ab Osterhaus, and from the University of Saskatchewan, led by John Mackenzie, did an excellent job, and deserve sincere thanks for producing such a thought-provoking, wide-ranging and rather exhausting programme.